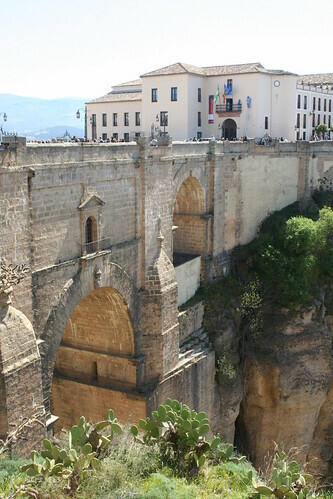 Last weekend found us in Ronda, a little town about an hour of here that sits perched atop the El Tajo Gorge, with majestic views of Andalucia. 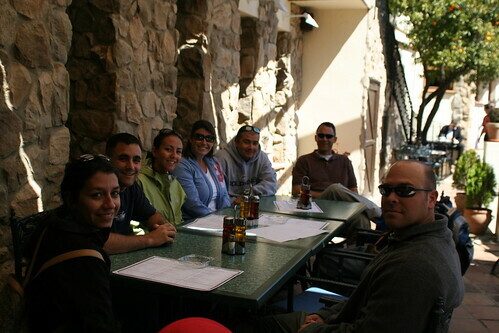 We headed out of town about 10 AM with 8 of our new friends and a beautiful sun-filled day. 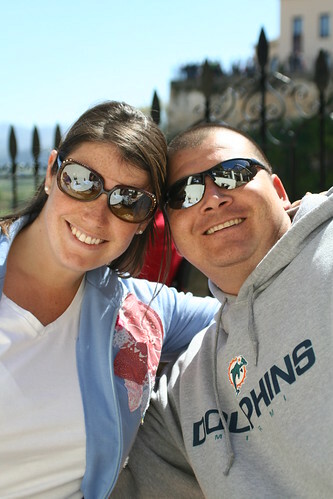 The car ride south took us through some very scenic countryside and up into the mountains of central Andalucia. 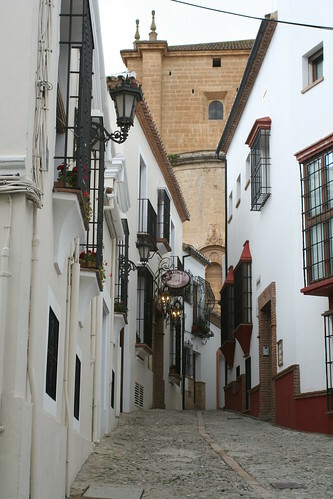 Ronda is one of Andalucia’s fastest growing towns and has all the trappings of a typical tourist jaunt. 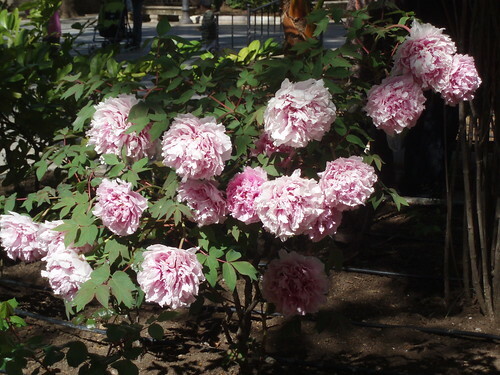 After we parked and headed through the park towards the gorge we were greeted with these beautiful peonies. Any day-trip that starts with these fluffy, papery-looking flowers is going to be a good one. Our first reaction to the views from the cliff were filled with much sudden inhalation and ‘ohhh’ sounds. However, seconds after stepping onto the terrace that overlooks the valley below, I pulled out my trusty point-and-shoot and got nothing but blank white photos on my LCD display. 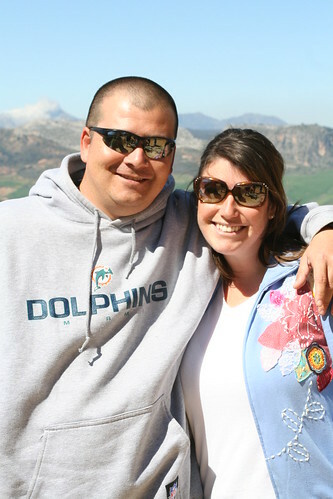 Luckily all our friends came equipped with cameras MUCH nicer than ours and were more than willing to share the views. 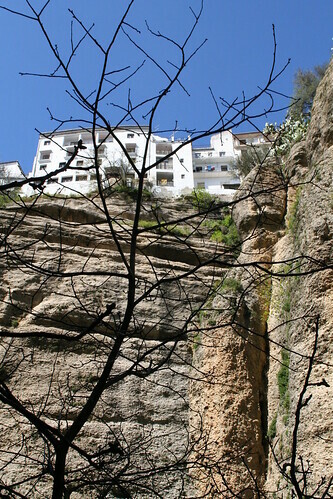 There are restaurants perched atop the gorge on both sides of the town, as you can see from this photo. This restaurant/cafe is used as a beautiful wedding setting in the warm spring months. 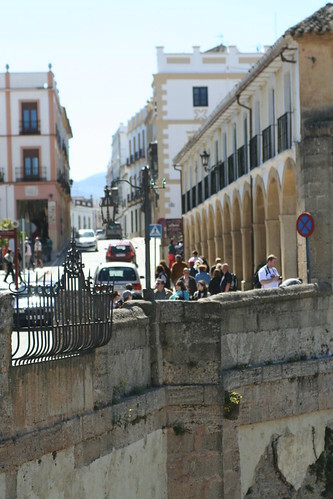 We wandered into town, which is spliced in half by the 18th century Puente Nuevo (New Bridge) which is hardly new. 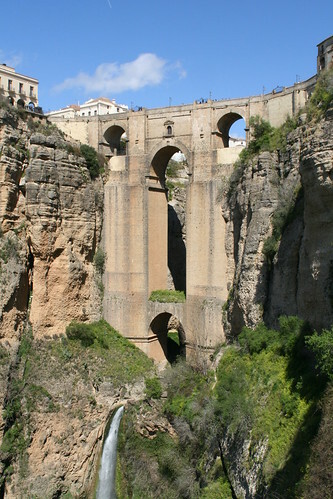 The Puente Nuevo sits atop a 100 meter chasm and was once used as a prison in the town of Ronda. 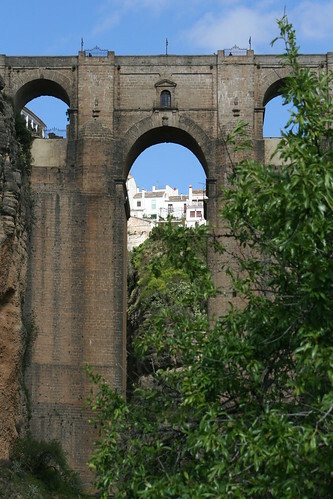 Imagine being held prisoner in that tiny little room in the middle of the bridge – no chance for escape. We hiked through the town and past the Plaza de Toros, the oldest bullfighting ring in Spain, home to Pedro Romero, the father of bullfighting as we know it. He was the first bullfighter to break free of the traditional Jerez school of horseback bullfighting in the 18th century. While I am not a bullfighting fan I do honor and respect the great traditions of my host country and find it’s history very interesting. For a wonderful depiction of the history of bullfighting pick up a copy of Miracle in Seville by James Michener. 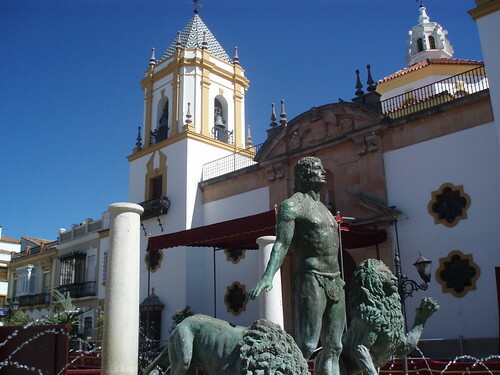 Ronda was also home to the famous painter, Goya. Every September, at the Feria Goyesca, attendees dress in the traditional Goyesca attire from the 18th century. 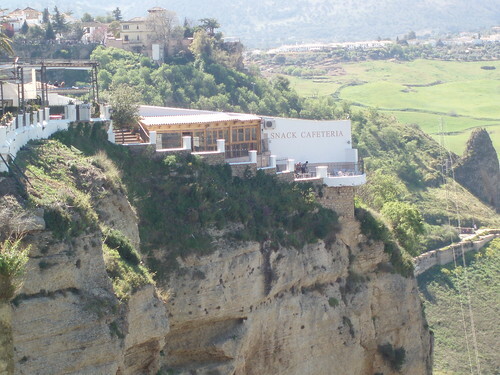 A sunny lunch on the terrace of Don Miquel’s offered gorgeous views of the countryside on the other side of the bridge. After lunch and despite the winds we decided to work off our garlic shrimp and chorizo platters with a hike to the bottom of the gorge. 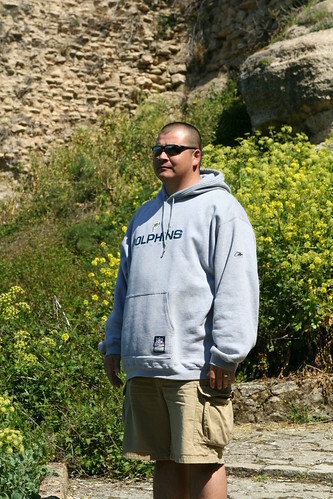 The majority of the pathway down was shallow, roughly built cobblestoned stairs, making it rather easy to navigate to the first stopping point. Sitting in his yard with an ancient rusty tin and even rustier-looking mutt, an old man asks for donations of a Euro or two as you walk through his yard to the next level of pathways. 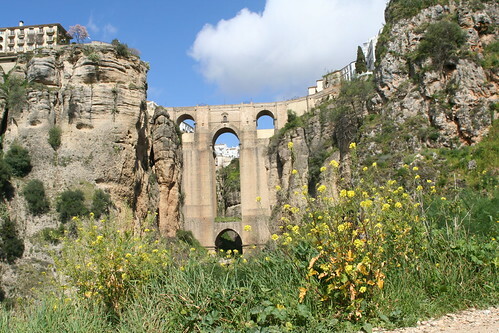 From there the hiking is down dirt and stone paths to the bottom of the bridge, running parallel to the Rio Guadalevín. We all tramped through the valley all the way to the bottom of the gorge and really got to appreciate the views of the enormous bridge. Once at the bottom we all sat and rested for a while to appreciate this spectacular view. The hike up was much harder but the journey was well worth the effort. I don’t think I could ever tire of looking at this bridge and it’s arresting views. 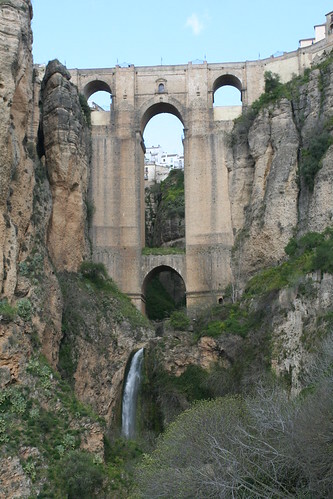 Before moving to Spain I had dreams of living in Ronda, although Joe’s commute to work would be a little excessive. 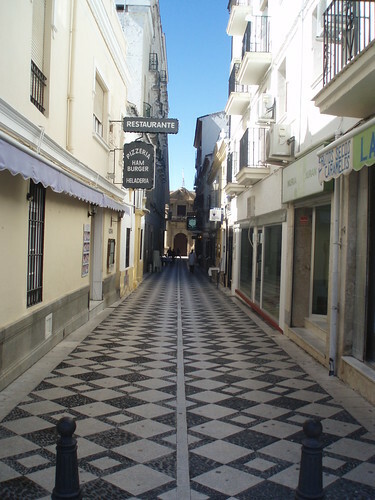 Once back at the top, we traversed the Rondeño streets and sat at a cafe, to warm up with some cafe con leche and a few bites of delicious pastry. Souvenir shops abound in this little town and one can hear many languages being spoken all at the same time. The girls did some window shopping but nobody left with anything worthwhile as the exorbitant tourist prices deterred us from becoming souvenir suckers. 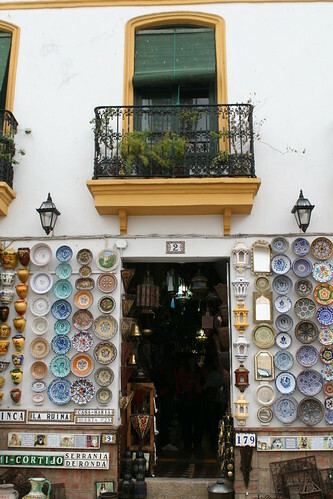 Being Spanish locals now, we know where to get the pottery, leather and hand embroidered shawls at local prices. On our way out of the city, some of the group did the stereotypical American thing and stopped for McDonald’s at the conveniently located golden arches in the center of town. I, on the other hand, opted to spend my calories on some delicious Spanish helado (ice cream). 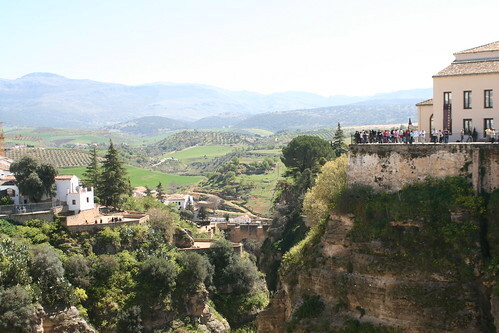 Joe and I will be back to Ronda, I am sure of it. Maybe next time we’ll picnic at the bottom of the gorge while the breeze blows through the canyon. Wow! Fabulous views – and that bridge – awesome!!! Thanks for sharing!